Wow, it’s October. It doesn’t seem quite possible to me that it’s almost Halloween but it is! 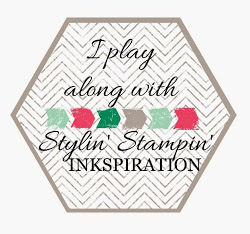 There are a TON of great new changes with Fun Stampers Journey this month and I’m so excited to share them with you!!! First is the launch of our new Be The Journey Trends Mini Catalog! 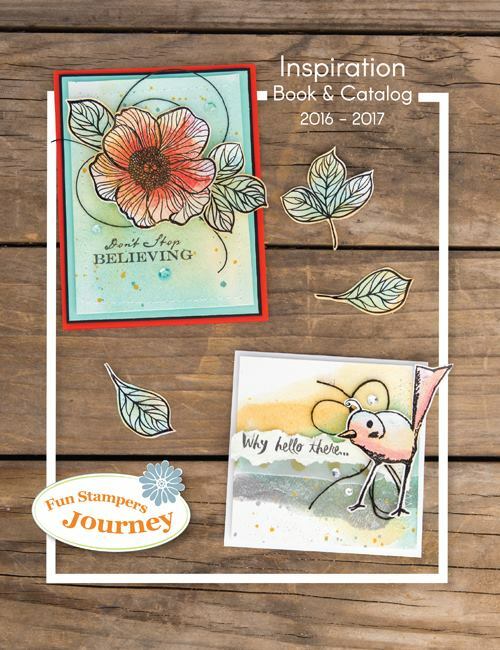 This amazing catalog runs from today (October 1, 2016) through December 31, 2016. This is by far one of my favorite mini catalogs thus far! New Bloom Benefits, new products, new collections, it’s just amazing!!! Click on the cover to see the flipbook! Second is the fabulous Amazing Memories Promotion! That’s 20% off memory keeping items this month! Albums, pages, and journal cards! Click here to see the full .pdf flyer showing all the prices! Third, October’s Bloom Box! Aren’t these the most beautiful fairies? This is a great month to sign up to receive the Bloom Box! $24.95 a month, includes a full-sized stamp set and packets to make 4 cards! You just provide ink and adhesive. Even better, if you are a Bloom Box subscriber you can come to my monthly Garden Party to make your cards. You will get to use my inks and tools so all you need is to bring your Bloom Box and adhesive. This fun party is my free gift to my subscribers. If you’re not a subscriber you can still join us for a small fee. To sign up for the Bloom Box go to my website and click Bloom Box at the top! 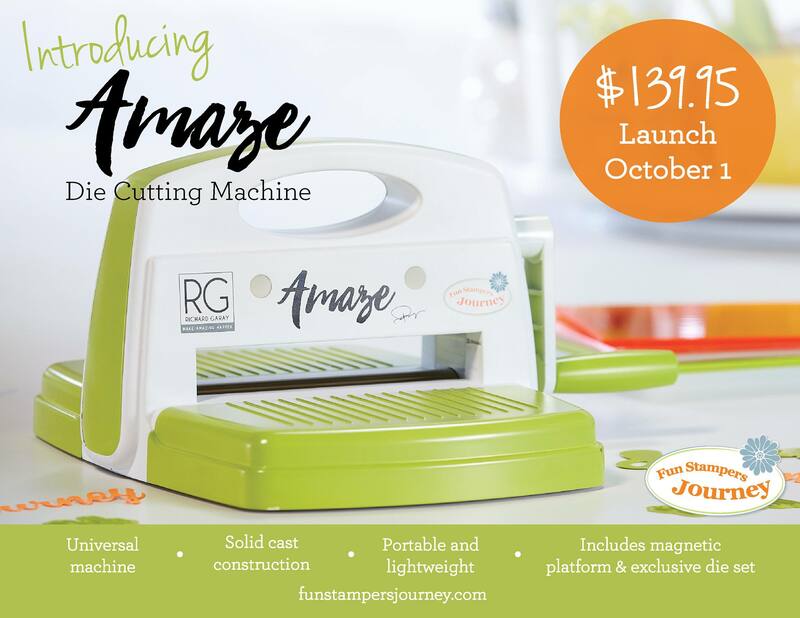 A wonderful new addition to the FSJ product line with this new catalog is the RG Amaze Die Cutting Machine! This adorable little machine includes a magnetic platform, 2 cutting plates, embossing plate, rubber mat, and an exclusive die set! It’s a STEAL at $139.95! What a great item to get at half price with your qualifying party! Contact me so we can schedule your Make It Party asap! An even better way to get it is to join the journey with me and get it in your starter kit! 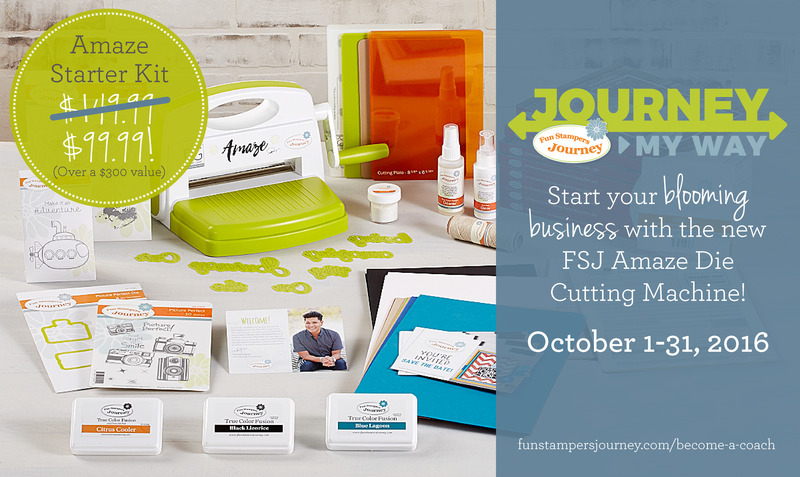 The new Journey Your Way starter kit is customizable and includes inks, stamps, dies, cardstock, business materials AND the RG Amaze Die Cutting Machine. It will normally be $149.99 but for the month of October you can join with this awesome kit for only $99.99! That’s less than the price of the machine and it includes over $300.00 in products and materials! You CANNOT beat it! You don’t just get the kit though, as a Journey Coach we receive so much amazing support and training from the Journey Station! Plus you will have me as your upline to walk with you through this fun new journey! Not to mention the 20% off you get for your personal orders and our low $150.00 per quarter minimum. That’s unheard of but it’s true! You can’t beat this amazing company! It’s super easy to sign up as a Journey Coach, you can go to my website and click Become a Coach or you can call or e-mail me and I will answer all your questions and walk you through the process! Finally I want to wish you a happy World Cardmaking Day! Now that I have this all updated I’m off to stamp! I’ll be back later this evening to share what I’ve made today! As always you can purchase any of the amazing deals I’ve mentioned or join me on this wonderful journey at my website or by e-mailing me! This is going to be a quick post, the monsoon has hit here in the desert and I’m afraid I’m going to lose power any minute. It’s beautiful here when it storms, but it can be viscious! Right now the thunder is so loud it is shaking the glasses in my cabinets! Crazy! It’s a perfect time for a lovely flower card, wouldn’t you say? I decided to play along with the Can You Case It #131 Color Challenge, which was to use Grays, Yellows and Black. I stamped the flowers and bees using our River Stone True Color Fusion Ink Pad and then colored the centers with the new Journey Color Splash Pencils. I love the pure gorgeous color of these pencils, they don’t get washed out like some watercolor pencils do, they keep true to the color. In this instance I used my Medium Journey Blending Brush (TO-0098) filled with water to dab a puddle of the color from the tip of the pencil and then painted in the centers and the stripes on my little bee. There are so many other ways to use the pencils too! This was my first time to use them, I can’t wait to play more! Now I’m going to turn the computer off and make sure I have some candles convenient! I love butterflies! There is something about them that is so graceful and fragile, yet so strong. We recently took a trip to San Antonio, Texas to visit my best friend Brandi and her family along with some other friends. During our time there went to the zoo, they have a butterfly house and of course I had to go in. It is so amazing to see, it almost moved me to tears just seeing them all flying around. Even little Brandon was enthralled. He wasn’t quite ready to touch one but he couldn’t take his eyes off of them! Today’s card is based on sketch 247 from Freshly Made Sketches. I love the simplicity of this sketch and I knew that it would go perfectly with the Beautiful Wings set. 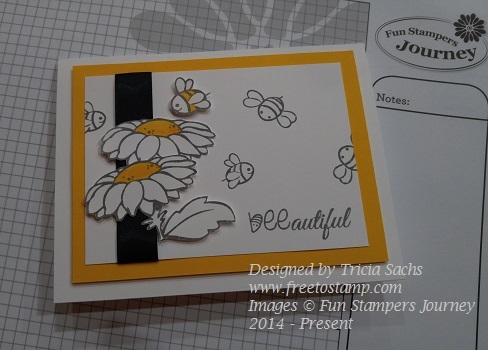 This three layer stamp is just beautiful, to me it really shows the delicacy and strength of butterflies. I love how the stamps make it easy to really show depth and color as well. I just love this color combo as well. The darkest purple is Pretty Pansy, I love what a deep rich purple it is. These pictures really don’t do the color justice. It is so bright and just WOW! What a deep purple is supposed to be. When doing the three step stamping I start with my lightest color, which in this case is Pretty Amethyst. The second layer is Grape Fusion, and the top layer, the details of the wings, the antennae, and the body is the Pretty Pansy. It’s just so beautiful, in fact it goes right with the sentiment, “Be your own kind of Beautiful”! Here is a closer shot so you can really see the detail. I used my circle dies to cut a piece of the Pretty Pansy and it is adhered directly onto the card. The butterfly however is fussy cut (with scissors, no die) and popped up on foam squares so it has a little more dimension. I love foam squares! Sometimes that little bitty pop can make all the difference in a card. I thought about adding some Journey Sparkle Dust to the butterfly but I really wanted it to stay simple and, for lack of a better word, pure. It’s just straight stamping on this one and I think it’s perfect! One final shot that shows off the dimension better. 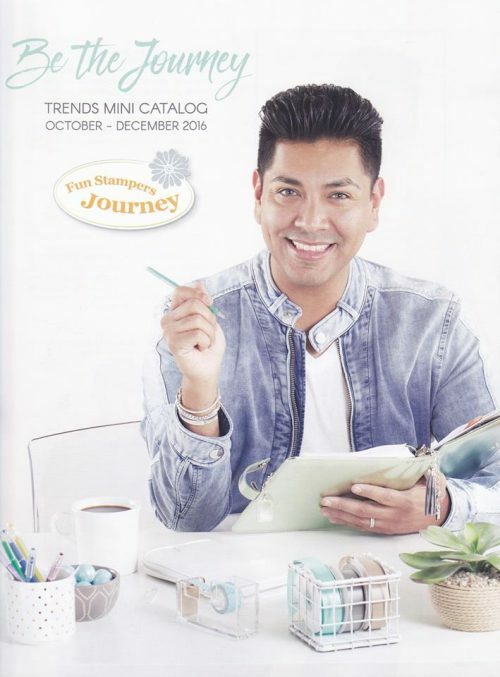 Richard Garay, the Fun Stampers Journey founder, says that, “when in doubt pop it out” and it’s so true! You can never go wrong by adding a little dimension to your project. Especially when there are multiple layers. That last element popped up really sets it apart from the other layers on your project. Let me know in the comments what you think. Also give me some suggestions on what other colors would work well with this stamp set. I love to receive input and feedback! Isn’t this an awesome way to think about life? People always say when life hands you lemons make lemonade. Well sure, lemonade is good but gosh, what if you don’t like lemonade? Then what? Then just keep them, they’re FREE! Who doesn’t love free stuff! Plus now you can make whatever you want with the lemons. Lemonade, Lemon Pie, Lemon Cake, Lemon Bread, use the zest to make soups or chicken or whatever you want! They’re now your lemons, and they were free! It’s more than just making the best of a bad situation, it’s turning it into something awesome just for you! I used my new J0urney Color Burst Pencils for the one popped out lemon. Using pencils number 017 and 018 to color it. The peel of the lemon was colored using 018, the pieces between the sections are each colored with 017 and the actual lemon pieces I colored with the two together. I layed down my lighter color (017) then colored over that with the darker (018). I then used my Color Burst Blenders to bring those two colors together for a perfect lemon color! The background was done using a technique called “Triple Time Stamping”. I layered the three white panels so that they were centered around each other, then just randomly stamped my lemons. THEN the magic happens when you pick them up, pop them each on their Lemon Drop panel and put it all together! It turns into such a fun background, don’t you think? Then it was just popping up the colored lemon and the sentiment panel and kabam, all done! Super simple and super cute! Back to the Color Burst Pencils, they’re amazing! There are 48 pencils in the set, all gorgeous colors! They are an oil based pencil so they are super smooth. They also blend beautifully! In fact, you’ll want to blend them because from those 48 colors you either have the FSJ colors OR you can blend the colors to make them. The inside of the lid, and the bottom of the tin have an awesome pallette printed on them that shows you which pencils match our colors OR what pencils to blend together to create that color. Guess What though? You can make your own custom colors as well, just play around with them! Isn’t that awesome!!! I love them, so much, I can’t wait to color more. I’m also going to tell you about our Color Splash pencils, but that will have to wait for another day. Finally, check out my calendar, I have all of my classes listed through the end of the year. Don’t miss out on them! My monthly Bloom Box Garden party is coming up on August 14th, then on August 27th is my Now & Wow party! We’ll be making some cards then learning how to put a little WOW on them! Plus I’ll be doing a Stamp ‘n Sip, a Christmas card class, Christmas gifts and more! Not to mention when you book your Make It Party you’ll see your name on my calendar too! Let me know what questions you have, and don’t forget to RSVP early and book your Make It Party! I wanted to share with you what the July Bloom Box cards looked like and then share the one that I made myself. The Bloom Box sets are so versatile, you have the cards that come prepared and ready to stamp but you can switch those around to personalize them AND when you are done with those the possibilities for the set are endless!!! I love the color combo as well! Of course there is Bubble Gum but that paired with the ??? Patterned Paper is just awesome! Not two colors I would think to put together but it works so well! Now I want to show you my card. 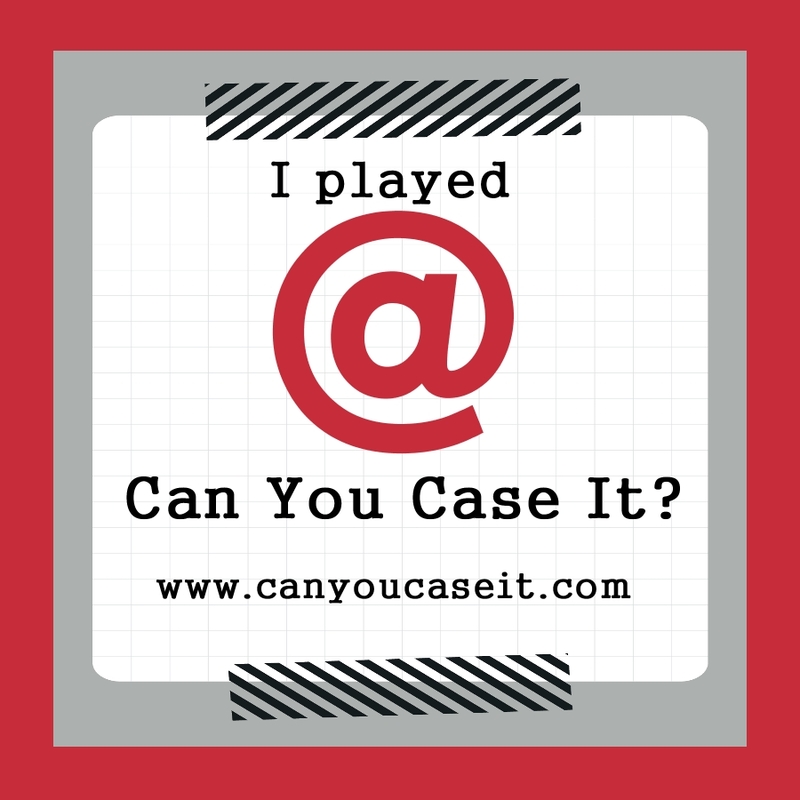 I started out with the Can You Case It (CYCI) challenge #128. 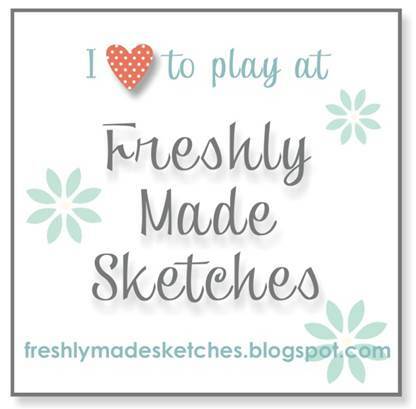 Of course a sketch challenge is just a starting point but it’s a great one. Once you see the layout then ideas will start to flow. Go with them, even if you don’t think it’s right, just start. Once you do then you’ll start to see things you didn’t see before, or have an idea. Keep going with it! Let the changes come, that’s part of the creative journey! Once I started looking at the sketch and the stamp I wanted to use I had to figure out colors. My mom loved dream catchers and her favorite color was purple. For some reason that memory really grabbed me and I knew purple was it. From that point on it was just a matter of playing with things until I got it exactly how I wanted. I think I colored three dream catchers before I got one that I liked! I ended up tying a bow with my Natural Journey Thread, it just needed that little bit to balance it out. Not overpowering but just enough, at least I think so. I hope you like this card, like I said it was super simple to come up with by using that sketch from CYCI! I love how easy and quick the Bloom Box cards were as well. It took me about 35 minutes to create all four Bloom Box cards. With everything all done it is super easy and quick! Using the sketch as my starting point it took about the same time for this one, that includes figuring out what I wanted and where, cutting cardstock, etc. Each month I do a “Garden Party”, this is a free class where you can come over and we’ll work on our Bloom Boxes together. In addition to the cards included in your Bloom Box I will have a bonus card for you as a thank you for subscribing! If you aren’t a Bloom Box Subscriber then you are welcome to come check it out. The class is free for Bloom Box subscribers but if you would just like to join us one month it is $12.00 and that includes all the cards, including the bonus card. My next Garden Party is for the August Bloom Box and will be on Sunday, August 14th at 3:00 pm. You can subscribe to the Bloom Boxes on my website, just click on Bloom Box at the top, everyone that signs up in July will get a special gift from me! Or if you want to check out the Garden Party without subscribing let me know. I received my very first Bloom Box today and wanted to share with you! 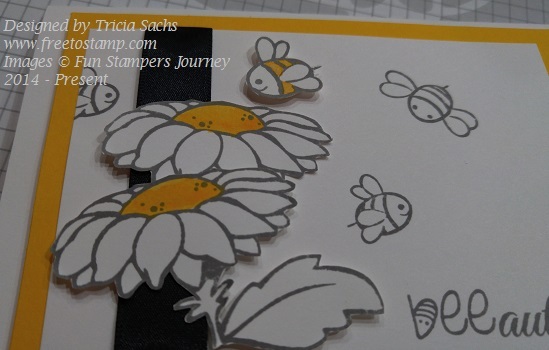 If you don’t know what a Bloom Box is it is the Fun Stampers Journey “Kit of the Month”. When you subscribe you will receive a Bloom Box once a month. All of the Bloom Boxes come with a full red-rubber indexed stamp set! Just like every stamp in the catalog this set is always red-rubber and ready to go, all you need is blocks. It also comes with the ingredients to make four individual cards, each one gorgeous and uses different supplies. All you need to work with your Bloom Box is the ink and some tools from your basic stamping kit. The cool thing about it is a list is posted of the supplies for that month’s Bloom Box so you can make sure you have all of the ingredients. Here is the box itself, It’s just adorable! Woo-Hoo! This is what I saw when I opened the box… so exciting to see a full color brochure with step by step instructions AND suggestions of coordinating products! This is the July stamp set. Again, full size and red rubber! Couldn’t ask for better! Card ingredients. Each of the four cards has a separate bagn for their ingredients, that helps keep it straight so you know which is which and don’t have to hunt for the pieces. Here is a closer look at the packets for each of the four cards. Notice that it incudes die-cuts, sequins, pearls, thread adn ribon, all of the embellishments, paper, and other embellishments included! You can get more info on the bloom boxes at my website, click on Bloom Box and you’ll see all the info! Stay tuned because tomorrow I’m going to post pictures of my cards plus details on a special I’m personally running for new Bloom Box subscribers! Hip Hip Hooray for the USA! I hope you all had a wonderful Independence Day! 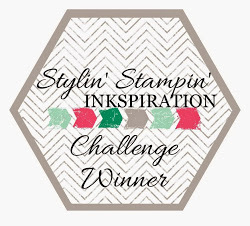 I finished up this card Monday for the Stylin’ Stampin’ INKspiration July Color Challenge! I just did not get a chance to post it. The challenge is to use Red, White, and Blue. Of course with it being Independence Day I had to go for that, but I used a stamp that I had originally thought of as a birthday stamp. It’s great for so many types of cards though, anything that needs to be celebrated or cheered about. The evolution of card design always fascinates me, at least the way it evolves for me. I started out with something completely different in mind and as I started working with it the changes occurred until I ended up with this design. I’m always amazed at how my idea changes as I work on it. A lot of trial and error before the finished product. That’s why I always say to start with a color, sketch, or even CASE something and watch it change right before your eyes! When I stamped the words it just needed something, then it hit me, sparkle! I used the Journey Glaze to add some Sparkle Dust to the dots on the letters but it still didn’t feel complete. Sooo, I applied Journey Glaze to the solid parts of the letters and kabam! Sparkle and Shine! I know it’s hard to see the shiny in pictures, it just doesn’t do it justice. Hopefully you can get an idea of what I did from this shot. Another thing you might notice is that the stars are white, not just plain wood. I had originally thought to make the stars red using one of our ink pads. As I got to looking at my colors and decided on my layout I realized I needed to make the stars white instead. So, I used my clear pigment ink pad on the stars and then embossed them with Journey White embossing powder. I love the little bit of shine that they got from it! One of the best things about this card? No fussy cutting! The stamp has a matching die! How AWESOME is that? I was able to cut the shape of the words with a few cranks of the handle! I love the variety of stamp sets with matching dies! Thanks for popping by, if you have any questions or would like to order any of the supplies I used you can go to my website and click shop, or you can shoot me an e-mail. Just remember that if your order is going to be $150.00 you need to e-mail it to me so you can get all of your amazing Hostess Benefits in addition to the Bloom Benefits you get just for a $50.00 order! Stamps: Hip Hip Bundle (BD-0143) or you can buy the stamp and die separately, but why would you want to when the Bundle saves you?